This MRI depicts a sagittal view of the head of a 15-year-old boy with GBM. My wife forwarded to me an article in the Washington Post that is absolutely fascinating. 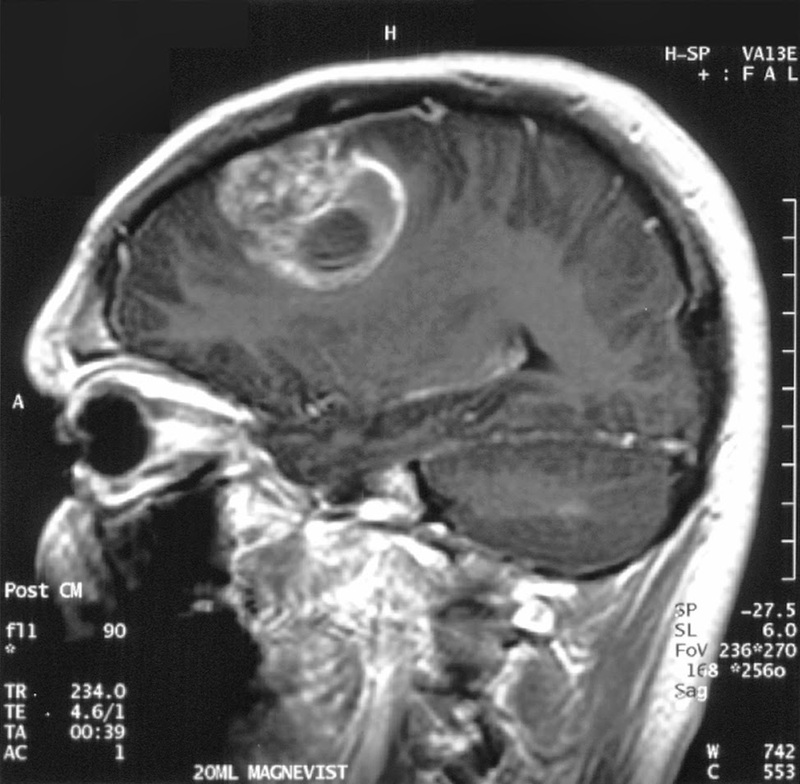 Glioblastoma multiforme is a particularly vicious type of brain cancer. It arises from neural tissue and is extremely aggressive, infiltrating in a fashion that makes surgical excision virtually impossible, and is resistant to radiation therapy and chemotherapy (because drugs have difficulty penetrating the blood/brain barrier). The Preston Robert Tisch Brain Cancer Center at Duke University has the largest experience on the East Coast with my sort of tumor, so I went there for further consultation and treatment. I returned to Duke a month after the infusion, and though an MRI showed some expected swelling, the more significant fact was that the tumor had stopped growing. I have gone back to Duke every two months since then, and the tumor, initially the size of a grape, is now a scar, the size of a small pea. It’s been two years since the initial biopsy and radiation, and one year since the experimental polio viral treatment, and I have no evidence of recurrence nor tumor regrowth. Finally some progress on this disease. I read about this several months ago in an abstract on eurekalert.org, but wasn't aware that the researchers were FDA-limited on the number of trial participants. Looks like this breakthrough won't be quick enough to help a friend of mine, though. It's great that once in awhile you see genuinely good news. People making real advances that will actually help people. -I had no idea this type of "Proxy War" was this old, but I guess so. Cracked ran one piece about how Malaria was used to cure Syphilis. -And there was also something about Toxo being fixed by either Malaria or Malaria-Drugs, once it gets lodged in your brain, that also makes you go abit bonkers for awhile. Either way, super cool post! Teaser for "Hug an Atheist"
Where are they now? Mahmoud Ahmadinejad. "Wind turbine syndrome" - organic or psychogenic? A field "teeming with Bronze Age gold rings"
You've got mail. From Vladimir Putin. Three images of "Up North"
Teeth of a "vampire syndrome"
This is a "hachure map"
"Progressives" can become "left-wing Puritans"